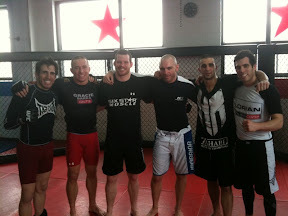 @GeorgesStPierre, @Kenny_Florian, @SeanPierson, Firas Zahabi, @keithflorian and me after rolling this morning. Then we ate and went to do yoga in a sauna. That's not my style but GSP likes it. Then we ate again and I went to hit mitts with Firas. Now I'm back at Jon's just resting waiting to see what's next.